Order in next 13 hours and 45 minutes for despatch today. Barbour Storm Half Zip Sweater. The Barbour Storm Half Zip Sweater is a wonderful thing, a waterproof sweater. Made in Scotland by Barbour from 100% Merino yarn, this sweater is not only waterproof but has a lightweight breathable Barbour Tartan lining. 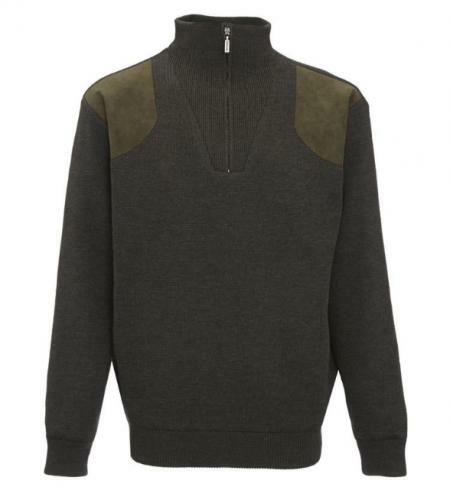 This Barbour sweater also features branded Alcantara patches and Barbour branded zip. Please handwash this Barbour sweater. Length 26-29 inches (67-73cm). Make your choice between navy blue or loden using the pull down menu below. This product has now been discontinued by Barbour, the size's in the variant chart below are what we have left.SALE!